I am not really a horror movie person. I rented the Tamil Horror thriller Pizza (2012), which was recommended over and over on the Quora post. It’s the debut feature film of writer/director Karthik Subbaraj. It was SO intense that I had to take a break in the middle of watching it. I am really impressed the level of scariness and creepiness the director was able to achieve with a guy running around an empty modern house with the lights out and carrying a shaky flashlight. It’s called Pizza because the main character is a young pizza delivery guy. Michael (Vijay Sethupathi) and his girlfriend Anu (Remya Nambeesan) live together. Anu is writing a ghost story novel, and doing research by watching lots of horror films. Anu finds out she’s pregnant, and that causes a crisis in their relationship as Michael doesn’t think he’s ready to be married. He’s not earning enough working at the pizza shop. Michael and Anu don’t seem to have any family. They patch things up, and we get a very sweet love song sequence. Michael makes a pizza delivery to a house, and then gets locked in when the woman who had answered the door goes up to get change. The lights have gone out, and that’s when things get super creepy and weird. 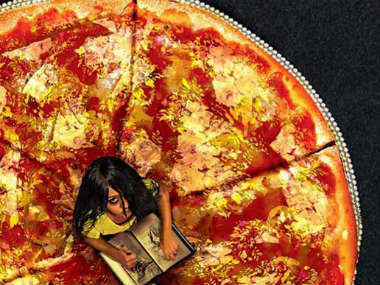 Pizza was the first Tamil film to use surround sound, and the soundscape of the film is part of what makes it such an effective thriller. About an hour in, I was so affected that I had to stop the film for a bit. It’s that good and intense. Realize that I’m a scaredy cat and I don’t usually watch many horror films at all. In the last 20 minutes or so of the film there is a great twist, and then a final double twist at the very end. Part of what makes the film so good is the performance of the lead Michael, Vijay Sethupathi. He was great. Not my usual choice of flick but I’m glad I saw it. These scrappy low budget filmmakers have to be so inventive. I’ll be looking forward to seeing Karthik Subbaraj’s other films when he has a bigger budget to work with. Sounds like this would definitely not be for me, since I am a total wimp with scarey movies! But I am very impressed that they were able to integrate a song sequence in an organic way. It was more a montage song sequence, like the Malayalam films do. Not a dancing and singing sequence. But still, a bit surprising to find in a horror film.